The Leccio apartment is set in the same building as Susino. Two families wishing to stay close together would find it ideal to book Susino and Leccio together. Access to the apartment is from the front of the barn where there is private outside area (part of a large paved courtyard) with garden furniture. It also has its own garden along one side of the house with space for eating out of doors. The entrance leads to the spacious sitting/dining room with two sofas. Kitchen area is provided with gas hob, fridge and electric oven. From the living room, a staircase leads up to an open gallery overlooking the living area. The gallery is provided with a single bed. A door in the sitting/dining room leads into a small hall with doors to the double bedroom and to the complete bathroom (shower, bidet, basin and wc). There is electric heating. Two independent apartments obtained from the conversion of a barn that is part of a charming hamlet in the heart of Tuscany. The hamlet dates back to the 13th century and dominates the surrounding vineyards, olive groves and woodlands from the top of a hill. Its position-inside the Chianti Classico area-is ideal to breath an air of absolute timelessness and tranquillity for a holiday of total relaxation immersed in nature. At the same time you'll find yourself in the heart of culture, as the hamlet is set near to the main places of historical interest of Tuscany. Both apartments have their own private garden areas. They are furnished with modern good taste maximising comfort and provide a typically Tuscan atmosphere with their combination of wood beamed ceilings, white washed walls and terracotta floors. The guests of the hamlet have free access to a 7X14Mt. swimming-pool and a tennis-court. Choosing these apartments you'll enjoy a wonderful holiday with all the best Tuscany can offer. 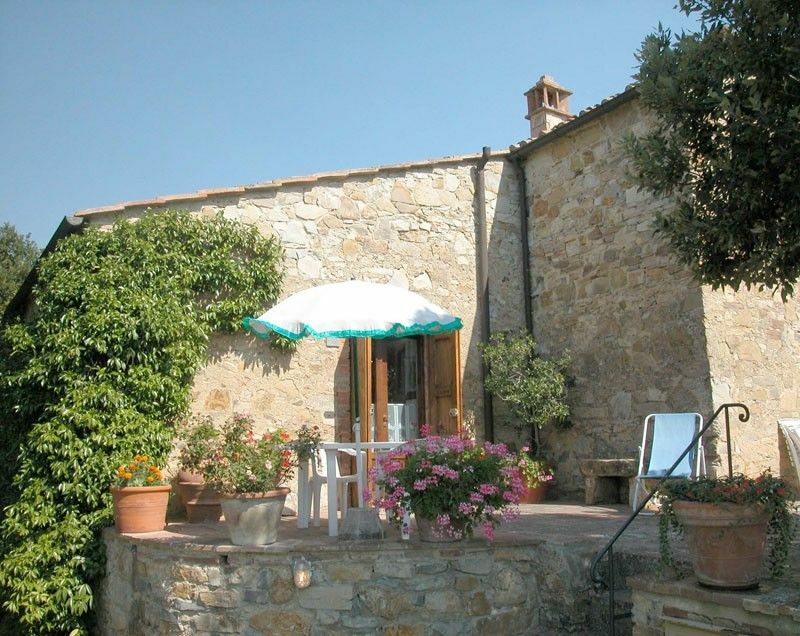 Chianti area: The two apartments are completely immersed in nature on the wonderful hills of Chianti. You need a car to get there. In the town of Poggibonsi (8 km.) you can find two big supermarkets and many shops for anything you need. Here there are also very good restaurants as well as in delightful Castellina in Chianti. There can be few things to compare with the pleasure of sitting out of doors drinking the wine which has been lovingly made from the grapes you see in the fields around. Nature and culture: The hamlet is a perfect starting point to explore the surrounding countryside on foot or by bike. Thanks to its position in the heart of Tuscany, it is also a strategic place in the heart of culture, as you can get in a little while to the most important tourist destinations. Not even the beautiful Tyrrhenian Sea is far, just an hour and a half by car. Local attractions: Chianti area is very interesting also by night with a wide variety of concerts and other cultural events. In summer you can't miss tasting an Italian ice-cream while you are walking among the charming towers of San Gimignano or viewing an opera in the main square of this medieval town. In July very nice medieval shows take place in Monteriggioni (16 km.) and Certaldo (20 km.). The world famous Palio horse race is held in Siena on July 2nd and August 16th. All these and many others are the good reasons to choose our apartments for an unforgettable holiday in Tuscany! If you like being away from the main road in the heart of natural countryside this is great. The owners were fantastic and their olive oil the best I have ever had. It is part of a larger restored development with a shared large pool but there were not that many people there when we were, which made it very quiet, great for us. The wildlife and scenery were beautiful, hoopoes, baby deer and incredible butterflies. Facilities are all a drive away so I would say it suits peole who enjoy splendid isolation. Gardens excellent, just sat out on the patio reading into the evening, chianti classico to hand. The flat itself was cool due to large rooms and perhaps basic in some areas but for the price and the surroundings, superb. My husband and I were looking for a relaxed holiday to unwind and we got it. We stayed in the one bed roomed Leccio apartment, set up on top of a hill top overlooking a valley full of vines. It is one of about 12 dwellings that have all been converted from the old farm house and outbuildings and very tastefully converted. The apartment was very clean and well maintained. There was appropriate furniture for both indoor and outdoor living and the kitchen was well stocked with crockery and cutlery. The owner was very helpful and friendly and answered all our questions about Italian living as well as questions about the flat and the surrounding area. His English was a bit hesitant but we understood each other OK. The best views down the valley were from the swimming pool. The pool was clean and well maintained. The tennis court was concrete - a bit crumbly in places but good enough for us. You approach the hamlet via a windy dirt track which was great. Tuscany was more hilly than we expected but was beautiful. We visited many of the local hill top towns which were beautiful and great to wander around with eating places and enough history to blow your mind! We didn't eat out much as we preferred the patio!! We would definitely recommend the place to a friend and in fact are thinking of going back ourselves!!! The Leccio apartment is a beautiful house,big enough for two people. We had a lovely time,it's very peaceful,surrounded by nature! Nice places to visit or to eat are nearby by car. When the weather was good we preferred to stay at the house and make our own meal,sitting on the patio or garden enjoying the view ! The owner's are very friendly and helpful ! All together it's a beautiful place and we recommend it to everybody ! Sehr schöne Unterkunft im typisch rustikalen toskanischen Stil. Inzwischen war ich nun schon das zweite mal dort! Absolut top gelegen, sowohl um Ausflüge in die Toskanischen Highlights zu unternehmen, als auch das kleine Dörfchen selbst. Da kann man über die ca. 1km lange geschotterte Anfahrt locker hinwegsehen. Darüberhinaus ist der direkte Kontakt zu den Vermietern ebenfalls sehr angenehm. Everything is included, except heating (that will be charged according to the amount used as shown on the meter).